When you buy from Kuhlmann’s, you know you’re getting the best in locally grown and locally sourced plants and vegetables. Kuhlmann's Greenhouse Garden Market is your place to source the freshest locally grown produce, Kuhlmann's grows a rich variety of flavourful vegetables which include; beans, beets, broccoli, brussell sprouts, carrots, corn, cabbage, cucumbers, celeriac, cauliflower, dill weed, garlic, kale, leeks, lettuce, onions, parsnips, peas, potatoes, pumpkins, radishes, rutabaga, swiss chard, spinach, squash, tomatoes and zuchini. We promise to always bring you the highest standard because that’s what you’ve come to expect from Kuhlmann’s since 1962. We’re not just a family farm, we’re a tradition. 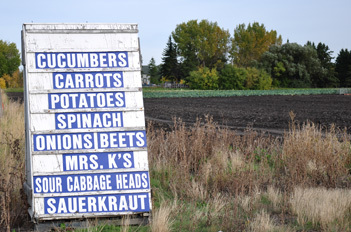 Kuhlmann’s Garden Market Greenhouse is a major contributor to the Edmonton community. We believe that giving back builds stronger communities and helps bring us closer together as a city. Check out our vegetable availability by clicking here.